It seems like everyone has an opinion on the newest player in the disc golf market- Prodigy. They made a dramatic entrance to the disc golf scene through social media, by having all their sponsored players cut ties (at least announcing their intention to cut ties) publicly and then maintain a mysterious holding pattern. There was a period of a month where speculation ran rampant for people not “in the know” (myself included), until the new year arrived. Once it was officially 2013, the speculation was put to rest and we learned what Prodigy was all about. 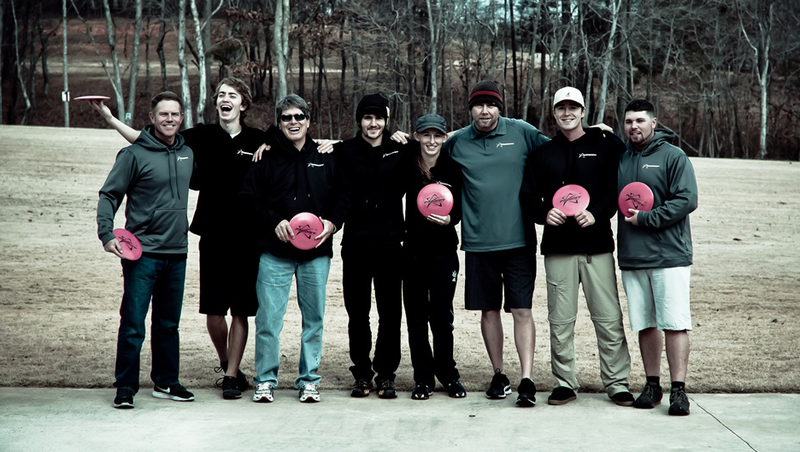 Their unique approach to sponsoring professional disc golfers on tour, combined with their intentions of making a more consistent golf disc- is what they claim sets them apart. It doesn’t sound like a very controversial situation, but nonetheless, the opinions are aplenty. All over Facebook there are lengthy debates between the “haters” and the “fan-boys.” When the #1 rated men’s player, Will Schusterick, won the 2013 Discraft Memorial and immediately pointed to the Prodigy logo on his shirt, and was mobbed by his Prodigy teammates- he unknowingly evoked strong emotions in the spectators. There is nothing wrong with being excited, and there is definitely nothing wrong with having teammates who support you. However, this kind of display is not exactly typical in disc golf. When you have teams, and you have players pointing to their jerseys, you automatically are going to get those “home-team sporting event” reactions. How did people in Cleveland feel watching Lebron James win a title for Miami with their newly formed all-star roster? Obviously, Schusterick is no Lebron, but you can hardly be surprised at fans of disc golf who start to react strongly and draw their lines in the sand to defend the companies they have supported for years. The other side of the coin is simply that Prodigy is trying to help further the game we all know and love. They are the “good guys.” There really ARE no bad guys. Why take the time to bad-mouth a company who is dedicated to improving the game? This is a very young company, who is trying not to fall prey to the same mistakes they believe other major manufacturers have made. Give them a chance! For the most part I agree with this. They deserve a LOT more slack and a LOT more time to prove themselves. They have set the bar very high by recruiting the best players in the game; but this is also why they are under the microscope. Quite a few people are quick to point out that the Prodigy players have an advantage right now because they are throwing “mixed bags.” There is nothing forcing them to throw any one disc over another. Nikko Locastro can putt with his Wizards, throw upshots with a Demon or a bar stamped Buzzz, it doesn’t matter. So in comparison to other players like Dave Feldberg or Eric McCabe who are throwing 100% new molds with their new sponsors, the Prodigy players don’t have as many growing pains. I, for one, think that this is undeniable. Prodigy players have a slight comfort and mental advantage at this point. However, I believe this is for their own benefit on multiple levels. The first reason for letting them throw any company’s discs (apart from the fact that Prodigy hasn’t released a full line-up yet) is so they can win. What better advertising is there than being a winner? What happens if Prodigy wins every NT this year? Sounds like a marketing slogan writer’s dream come true. They’re also more apt to feel confident moving forward if they win a tournament or two… and why not give them the chance to win bigger purses as well as performance bonuses in the company’s formative years? Let’s also not forget a very obvious benefit of throwing a mixed bag of discs at the highest level: research. There were a couple folks posting that they saw Will Schusterick throw a Lat 64 disc at the Memorial- as if it were a major development. It may be something we’re not used to, but Lat 64 is probably one of Prodigy’s biggest competitors, as they are both growing companies known for their high quality plastics. Let me put it this way: if I started a car company tomorrow and hired a group of professional drivers, what harm would there be in letting them drive any car they wanted for the entire next calendar year; while I asked them for feedback and opinions on what they loved about the latest Ferrari or Aston Martin? It’s funny actually, I can’t make up my mind about Prodigy. One minute I’m annoyed with their lack of product (how can a company with two discs sponsor a dozen top players? ), but the next minute I love the fact that they stuck it to the big companies (Discraft and Innova) by showing more attention and respect to the players on tour. But making up my mind isn’t the point; I’m perfectly content to be hot and cold with regard to Prodigy. The point is simply that their shake-up in 2013 has made it an issue. Four years ago, I would click on the PDGA website each weekend to find out if Nikko won, or if Feldberg beat him. Now there are so many more layers to this season’s tour, and if you’re trying to figure out who to root for- it means you’re watching… it means you’re paying attention. This entry was posted in Opinions & Technique, Touring Pros and tagged disc, golf, new, NT, opinion, pro, prodigy, professional, sponsor, tour. Bookmark the permalink. I never thought of it from the aspect of creating teams of rivalries the way you had depicted it before, and I think that’s spot on. Over time, it will be less about the brand being represented and more about the individual players brand. Also, on the note of Lat64 and Prodigy being competitors… I don’t see it quite that way. I see it that when the tide rises, all the boats in the harbor rise together. In other words, they are inadvertently doing advertising for one another by being a brand that offers high quality product.